Kirkwood Trading Company is one of the few local St. Louis companies that provides custom printed coffee mugs. Since we print the mugs in-house the turn around time is super fast and typically can receive them in a few days depending on quantity. We offer a few different styles of mugs so there typically is something to fit everyone’s needs. The nice thing about mugs that differs from screen printing is that the process doesn’t count colors. So a full color photo print on a mug costs the same as a single color mug print. So the opportunity to get creative doesn’t cost a whole lot more. Popular clientele who have ordered custom printed coffee mugs consists of schools, churches, businesses, events, clubs, and organizations. Although really there is no bad reason to have a custom printed mug. Unlike quantity minimums we have for custom t-shirts and screen printed apparel, there is no minimum for mugs. 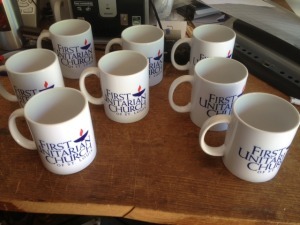 While the more you buy the less each costs, we can print single mugs and can print as many as a thousand. Specific recent custom printed coffee mugs orders have been for birthday’s for the coffee drinking age, churches who provide new parishioners, gag gifts for a gentleman’s work. In addition to custom printed coffee mugs we have a full line of other items we can customize which include custom phone cases, puzzles, water bottles, mouse pads, koozies, travel mugs, name tags, and over 100 other products that we customize separate from the logo apparel.